Tonight’s SmackDown takes place from Wichita, Kansas and is the go-home show for the Royal Rumble. WWE Champion Daniel Bryan defends against AJ Styles this Sunday. They attacked each other over the past few weeks and even brawled in the concession stands. Tonight, Bryan and Styles will take part in a face-to-face segment with Vince McMahon moderating. 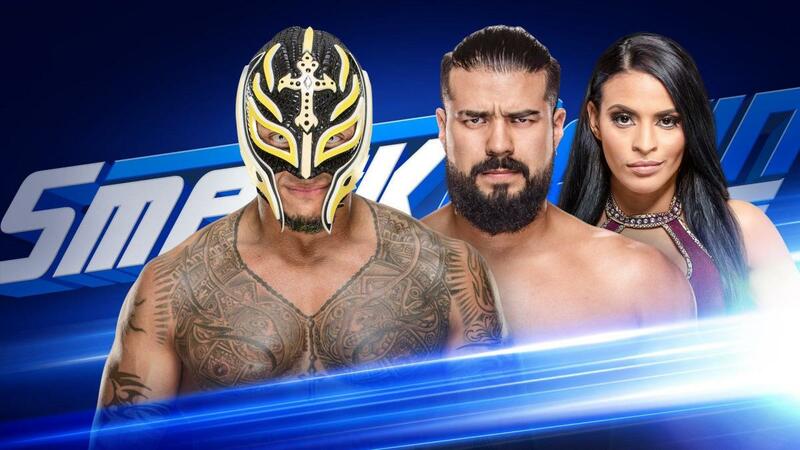 After tearing the house down last week, Andrade takes on Rey Mysterio in a two-out-of-three falls match tonight. Last Tuesday was the second straight week that Andrade scored a pin on Mysterio, and he's looking to make it three weeks in a row. WWE will follow up on last week's angle with Naomi, Mandy Rose, and Jimmy Uso with Naomi and Rose facing off tonight. The Miz also takes on Cesaro ahead of Miz & Shane McMahon challenging for Cesaro & Sheamus' SmackDown Tag Team titles at the Royal Rumble on Sunday. Becky Lynch came down to the ring to start SmackDown. Lynch noted everyone has an opinion about how The Man should be acting and what’s next for The Man. She said the only thing that's next for the Man is the main event of WrestleMania. She turned her attention to her match with Asuka Sunday night. She pointed out that Asuka never beat her for the title. She promised to win the title back at the Royal Rumble. She will do whatever it takes to win the belt back. Asuka interrupted and came down to the ring. They went face-to-face and yelled at each other. Charlotte Flair then came out and walked down the ramp. Flair noted she enjoys seeing them argue. She promises to win the Royal Rumble and go to WrestleMania. She then discussed all the potential matches against Sasha Banks, Ronda Rousey, Asuka or Lynch. Asuka attacked Lynch from behind. Lynch fought back and made a comeback. She threw Asuka over the announce table and whipped her with her jacket. Flair smiled as she walked off. Asuka yelled at Lynch as she walked away. Backstage, Lynch and Asuka continued to brawl as officials and referees struggled to separate them. Naomi jumped Rose on the ramp to start the match. Naomi was firmly in control until Rose hit a clothesline. Naomi fired back with a kick to the side of the head. She followed up with a hurricanrana. Naomi ended up on the apron and nailed Rose with a forearm. The force from the hit caused Rose to bump into the referee. Deville tried to pull Naomi off the apron but she kicked her off. Rose then sent Naomi head first into the ring post for the win. Jimmy Uso came out to console Naomi after her loss. In the back, Rey Mysterio talked about his 2006 Royal Rumble win. He talked about everything it took to win and he plans to repeat that Sunday. However, tonight is about respect. He noted that Zelina Vega’s banned from ringside. Mysterio promised to defeat Andrade later. Cesaro nailed Miz with uppercuts to gain an early advantage. Miz fought back and locked on the figure-four. Back from commercial, Cesaro was firmly in control. Miz made a comeback and hit the running dropkicks in the corner. Cesaro fired back with an uppercut. Cesaro attempted a pin with his feet on the ropes. McMahon pushed his feet off and Sheamus took out McMahon. The finish came when Sheamus rocked Miz with a kick and Cesaro hit the Neutralizer for the win. After the match, McMahon attacked The Bar. He put Cesaro on the announce table and climbed to the top turnbuckle but Sheamus shoved him off. Sheamus hit the Brogue kick on McMahon and they beat him down. Miz tried to cover McMahon to protect him. The Bar placed Miz on the announce table and then picked up McMahon and dropped him on Miz. The medical staff ran out to check on Miz and McMahon. In a video package, Mustafa Ali did a great promo about Samoa Joe’s attack from last week and their upcoming match. He talked about seeing the truth in Joe’s eyes. He told Joe to look into his eyes and Joe will see Ali knows he can beat him. Backstage, Vince McMahon watched on the monitor as medical staff checked on Shane and Miz. Vince McMahon came down to the ring for the face-to-face. He’s not going to comment on The Bar’s attack on The Miz and his son, Shane. Instead, he introduced AJ Styles and WWE Champion Daniel Bryan. Bryan refused to enter the ring with a sociopath so he stayed on the floor. He’s embarrassed to be in the ring with Styles. Bryan can’t let Styles win the title. He noted Styles wants his fans to eat horribly and wear his merchandise. Styles uses his power for money but Bryan uses his power for the greater good. Bryan pointed out that Styles might entertain the fans but he doesn’t make them think. Bryan doesn’t care about the people’s feelings. Bryan’s not the People’s Champion. He’s the Planet’s Champion. Styles said if the planet had a voice it would tell him to shut up. He noted Bryan didn’t ride a bike to the arena and flew on a plane to get here just like he did. Styles called him fickle and then fans broke into a fickle chant. Styles said the real reason Bryan won't get in the ring is that he’s afraid. Styles said Bryan is going to have nothing left when he beats him for the title. Bryan tried to speak but McMahon cut him off and told him to get in the ring. Bryan’s not surprised that McMahon doesn’t want to hear this. He called McMahon a parasite. Bryan noted McMahon’s destroyed the planet and is hoarding all the wealth. He said McMahon created a platform for a person like Styles. McMahon yelled at Bryan to get in the ring again. The crowd broke into a loud Yes chant. Styles pointed out the face-to-face can happen outside the ring. Styles attacked Bryan and beat him around ringside. He threw Bryan back in the ring and set up for the Phenomenal Forearm. Bryan hid behind McMahon so Styles changed direction. Bryan then hit the running knee on Styles. In the back, R-Truth and Carmella discussed entering the Royal Rumble last. Truth said if he wins he's not facing Brock Lesnar because he doesn’t want to go the Sioux Falls City. Carmella corrected him that it's Suplex City and Truth said he doesn't want to go there either. Carmella then ran into Charlotte Flair. Carmella reminded Flair that she’s number 30. Flair promised to win Sunday night and noted Carmella can’t stop her. Joe was firmly in control and sent Ali to the floor. He tried to throw Ali into the ring post but Ali jumped on to the apron. He climbed the second rope and hit a cross body. Ali tried a springboard but Joe shoved him and Ali crashed on the apron hard. Back from commercial, Joe had to advantage and scored a two count. Ali fought back and hit the rolling X-factor. He followed up with a dive to the floor. Ali hit a superkick and tornado DDT for a near fall. Ali went up for the 054 but Joe crotched Ali and locked on the Coquina Clutch for the win. In the back, The New Day was looking at Kofi Kingston’s past Royal Rumble moments. Kayla Braxton entered and asked if the New Day will eliminate each other. They said they win has a team. Kingston was sad that he might not be able to keep his feet off the ground this year. Woods and Big E told Kingston to cheer up. Kingston then came up with an idea but wouldn’t tell Braxton. Mysterio sent Andrade to the floor and followed up with a hurricanrana from inside the ring to the outside. Mysterio ended up on the apron and rocked Andrade with a kick. He followed up with a seated senton. Mysterio then attempted a springboard cross body but Andrade caught him with a dropkick. Mysterio attempted a hurricanrana from the second turnbuckle but Andrade held on. He then stepped up from the second turnbuckle to top turnbuckle and hit a sit out powerbomb to win the first fall. Andrade hit a second powerbomb for a near fall. He then picked up Mysterio for another powerbomb but Mysterio countered into the Canadian Destroyer to win the second fall. Back from commercial, Andrade missed a charge in the corner and fell to the floor. Mysterio then hit a sliding dive under the bottom rope into a sunset flip, which sent Andrade into the barricade. Mysterio hit a hurricanrana for a close near fall. Andrade fought back and locked on the armbar in the ropes. Mysterio attempted a sunset flip to the floor but Andrade landed on his feet. Andrade then gave Mysterio a powerbomb into the ring post. Andrade hit the Hammerlock DDT but Mysterio got his foot on the bottom rope. Andrade placed Mysterio on his shoulders but Mysterio hit a reverse hurricanrana for a close near fall. Mysterio then hit the 619 but Samoa Joe ran out and pulled Mysterio off the apron. He then gave Mysterio a powerbomb onto the apron. Joe attacked Andrade and then locked on the Coquina clutch on Mysterio. After the match, Joe said he’s going to eliminate all 29 guys on Sunday. Joe promised he was going to win the Rumble. Suddenly, Randy Orton showed up hit the RKO on Joe out of nowhere. The fans went nuts for Orton.